Aval/Rice Flakes is a main ingredient for Gokulashtami/Krishna Jayanthi. Here is a simple and colourful vegetable upma. This is ideal for breakfast or tiffin. Wash, Rinse the aval. Remove water and keep aside. In a kadai/wok, add oil mustard. Wait till it splutters. Now add asafotida, jeera and channa dal. saute till its brown. Add the vegetables, little salt and cook it. When its cooked add aval and salt and mix well. 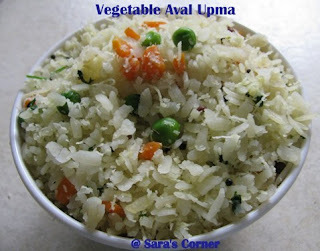 Veggie Aval Upma is ready to serve. Now the winner of my Giveaway for Anniversary. That is Sanyukta Gour. Congratulations!!! I will get in touch with you. Wow,never tried with vegetable looks very nice! Will try sometime! i never tried dis upma....healthy one! Beautiful looking upma, congrats to the winner..
Yummy and delicious upma.. looks too good !! Healthy upma with the veggies. I've never had aval. It looks and sounds delicious. This dish looks delicious and very nice and colorful. this recipe is really helpful for a vegetarian like me. thanks for posting this healthy recipe. keep posting.